The ambitions of Land Rover BAR to win the 35th America's Cup – and finally bring the trophy back home to Britain after 166 years – took solid form today, with the launch and christening of their America's Cup Class race boat in Bermuda. The menacing, matt black boat represents the combined efforts across three years of the now 120-strong team and their partners. After the launch of four test boats, 85,000 hours of design and build, on the water testing and painstaking construction, the team has seen its efforts crystallised into the boat code-named R1. 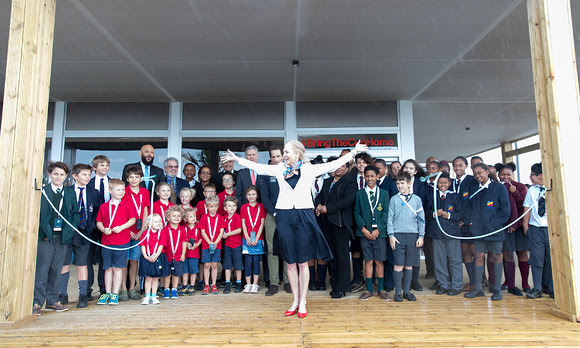 Sir Ben Ainslie's wife Georgie and baby daughter Bellatrix appropriately smashed a bottle of English sparkling Nyetimber wine to christen Land Rover BAR's America's Cup Class race boat Rita – the name carried by all 19 of Ben's previous Olympic and world championship winning boats. With just 107 days to the start of racing, the team will continue with their intensive testing and development programme, which will now include 'in-house' racing against their test boat 'T3'. The America's Cup has changed beyond all recognition in its 166 year history as both a sporting and design contest. In the first race, back in 1851 a fleet of big, traditional yachts sailed all the way around the Isle of Wight at speeds in single digit nautical miles per hour, crewed by dozens of men with nothing more technical than a compass, thousands of metres of rope, and the trusty block and tackle. In 2017 in Bermuda, the 21st British Challenger for the America's Cup will race on a tightly defined course of just a few miles at speeds that could reach 60mph. There will only be six men onboard, the boat will fly over the surface supported by high-tech hydrofoils, and while there will be just 67m of rope on board, there will be 130m of hydraulic pipes, and over 1200m of electronic and electrical cabling connecting 190 sensors and four video cameras – all in a 15m boat! This is no longer just about naval architecture, the design and engineering war is fought on all fronts; systems, electronics, hydraulics, computers and software. "It's a great moment to see our AC50 Race boat hit the water in Bermuda. The launch represents the sum of all the team's efforts to bring the America's Cup home, and we're delighted to get her in the water here in Bermuda. We're a start-up team, and we had to build not just the boat but the design and engineering team, the facilities and the processes to get to this point today. There are just a few short months before the racing starts at the end of May, and we will be working very hard now on the final development and testing of this boat to make sure we are ready for the racing." "The design, engineering and build process for a boat of this complexity stretches back to the very earliest days of the campaign. Everyone in the team and all our partners have contributed to getting this boat ready here today, and we're all very proud of the achievement. The innovation, technology and attention to detail in the design and construction continue the America's Cup's traditions of the most advanced sailboats on the planet. We believe this is the most sophisticated and best prepared British challenger, with a total campaign design effort of 50,000 hours, and a construction effort of 35,000 hours for Rita." On the same day, 11th Hour Racing Co-Founder Wendy Schmidt opened the 11th Hour Racing Exploration Zone at the team's base in Bermuda. This dedicated educational space brings to life critical topics around ocean health, sustainability, innovation and technology, with a series of creative displays. The ocean is our playing field and we want to preserve it: supported by Land Rover BAR's Exclusive Sustainability Partner, 11th Hour Racing, the Exploration Zone will inspire audiences to make a tangible and positive impact by reducing ocean plastics, learning about the power of the sun as a source of renewable energy, and understanding the devastating effects of invasive species, particularly the lionfish that infests Bermudian waters. Other exhibits highlight the team's sporting and design challenge, and the technology and innovations that enable the latest generation of wing-sailed, hydrofoiling America's Cup multihulls that fly. 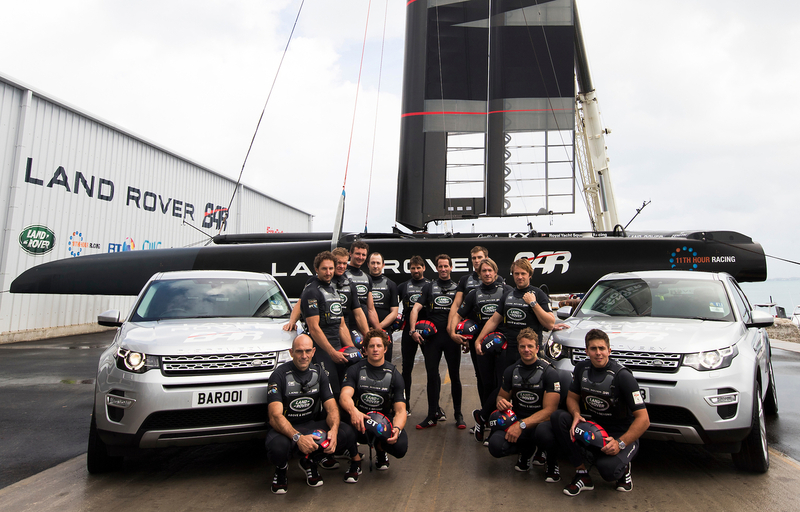 Land Rover BAR are bringing this unique, inspirational experience to Bermuda as part of their ambition to be the planet's most sustainable professional sports team and to engage with a number of different audiences: local residents, tourists, sailing enthusiasts, media, families and school groups are all expected to visit. The 11th Hour Racing Exploration Zone can also be used as a classroom space dedicated to delivering lessons resourcing the team's online digital education programme, BT STEM Crew. Children from six local middle schools attended the opening, and were treated to lessons on invasive species and mechanisms along with a tour of the exhibits. "With the 11th Hour Racing Exploration Zone, we hope to create a legacy lasting well beyond the 35th America's Cup. Through interactive displays, we focus on some of the concerns that are top of mind for all of us: which invasive species is creating havoc in the Atlantic Ocean? How widespread is the problem of ocean plastic pollution? We also look at bigger issues, such as what it means to have a circular economy and how we can accelerate the transition to the use of more renewable energy. 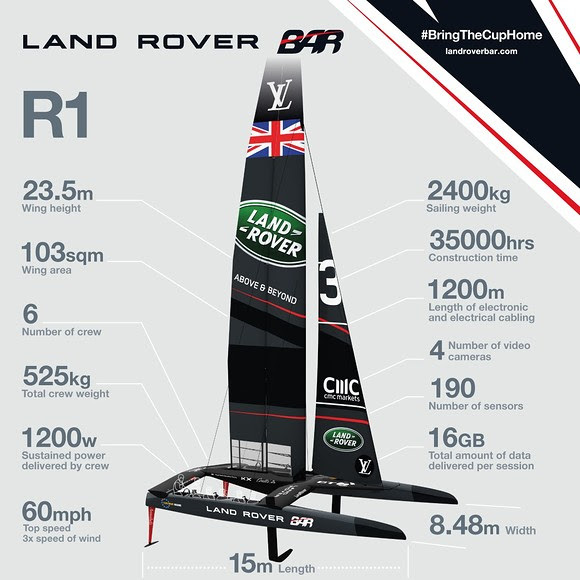 We are thrilled to share this story with Land Rover BAR's fans, sailing and sports enthusiasts, the public, and we hope to capture their imagination and spark creativity and interest in our oceans." The only place to catch all the action exclusively live from Bermuda this summer is on BT Sport, the official UK broadcaster of the Americas Cup 2017.